For all the game lovers out there that want to enjoy a great action game, we have the perfect suggestion. 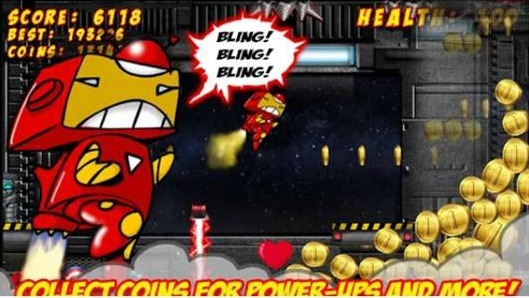 We present to you Superhero Jetpack Robot Game, easy to play, yet very challenging Android game. It offers tons of features that can entertain you for hours. The developers, Free Play Games, created it with amazing graphics and even more amazing sound effects. When you start playing this game, you will quickly figure out how to play. With simple controls (just touching on your device’s display) you will be able to maneuver your character, the robot super hero. Use his action skills and powers and advance in your gameplay by getting as far as you can. Try to avoid the upcoming obstacles and defeat the robot enemies that are trying to hurt you. If their attacks get to you, your health will decrease and you will lose the game. But, don’t worry, with each restart you will be able to improve your action strategies and reach higher scores. There are tons of coins and power-up on your way. Collect them and use them for better protection and for other cool advantages. Play against users from all around the world, challenge yourself and share Superhero Jetpack Robot Game with your friends. You can find it on Google Play, free, with multiple in-app purchases.